After I published the photograph of Dutch sitting in front of the old Farmers and Merchants Bank, I got a message from Toni Eftink, projects manager of Old Town Cape. The bank was incorporated in 1904 and moved to the two-story red brick structure at 701 Good Hope in 1923. 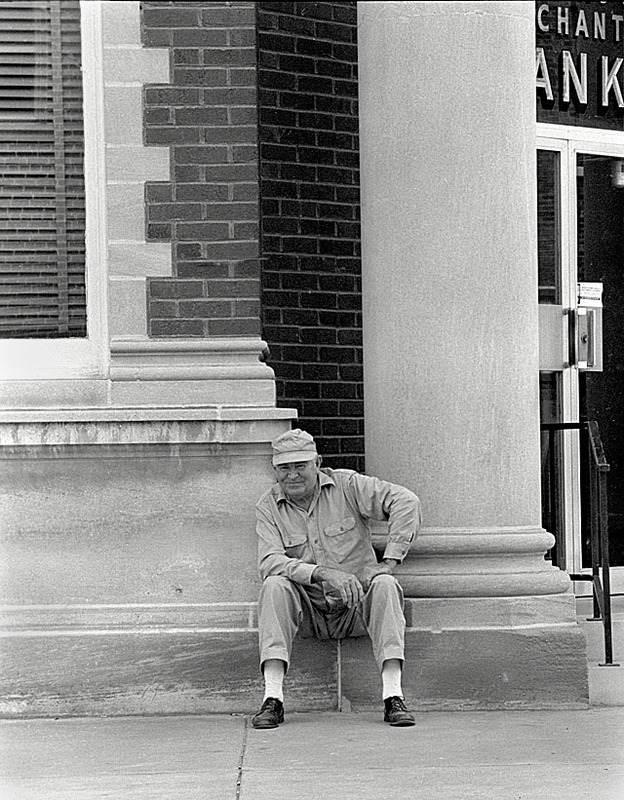 It was the oldest operating banking facility in Cape Girardeau. That bank, located in the Haarig business district, catered to the early German-Americans who settled in the Good Hope area. It was expanded in 1936, and a drive-in window was added (depending on which story you read) in 1956 or 1970. It was sold to Boatmen’s Bank in 1982. Boatmen’s Bank became Nation’s Bank, which became Bank of America. Major structural problems were discovered in the Salvation Army’s headquarter building at 215 Broadway in the spring of 1985. About the same time, a Missourian story quoted James P. Limbaugh, vice president, as saying that the Cape’s western migration had taken the bank’s customer base with it. 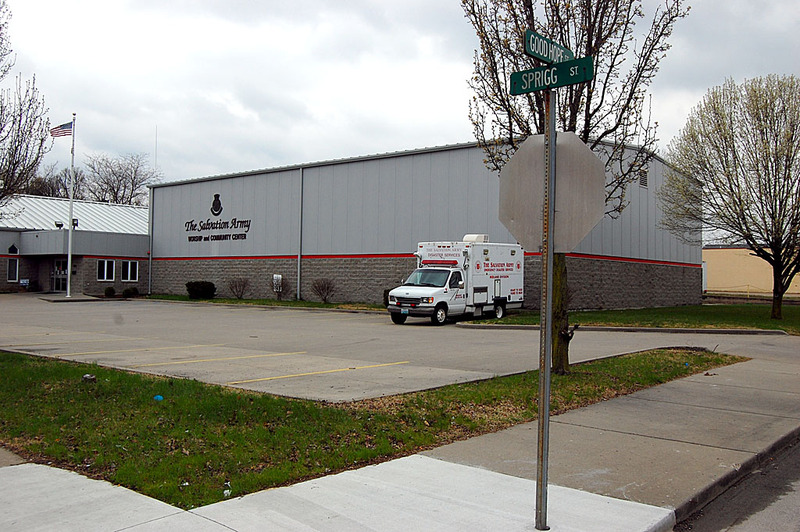 The bank was using only about 25 percent of the building’s 13,000 square feet. 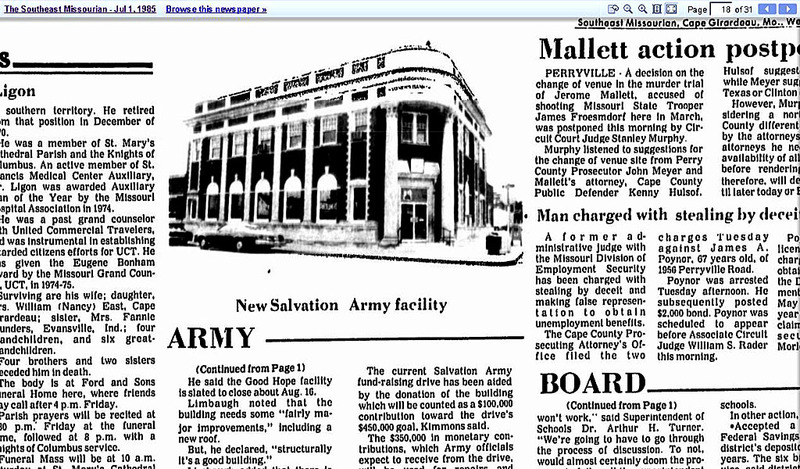 It had already been downgraded to a branch office when a new main facility was built on William St. in the early 70s. Limbaugh said the facility needed a new roof and some other “fairly major improvements,” but “structurally it’s a good building.” He said there is an “emotional and sentimental attraction to the building” and that bank officials are happy that the structure can be put to good use. For their part, the Salvation Army was ecstatic: “That’s a tremendous gift, something almost beyond words,” a community relations director in St. Louis said. Not long after the Salvation Army moved into the bank, it started beating the drum to build a new facility on the property. 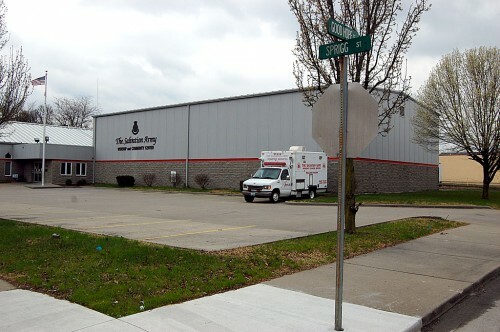 The organization complained that the building didn’t meet its needs – only about 4,200 square feet of the 13,000 square feet were usable, compared to a new building with 17,200 feet of space. Despite the opposition of local historic groups, the bank was razed in 1995. The massive bank building that anchored a major corner in the Haarig District for more than six decades is now a parking lot and what you see above. I have a lot of respect for the work the Salvation Army does, but I sure miss seeing the Farmers and Merchants Bank when I drive down that block. Thanks for the answer Ken. 🙂 Looks like it was a beauty at one time. Sad it had to go! My wife & I had as our first doctor after our 1949 marriage, Dr. John Crow who’s office was on the second floor of the F&M bank. He went on to deliver our 3 daughters at the old St. Francis hospital on Good Hope. I think his son went on to become a doctoe too. Awww, love the picture of my dear friend Toni Eftink! 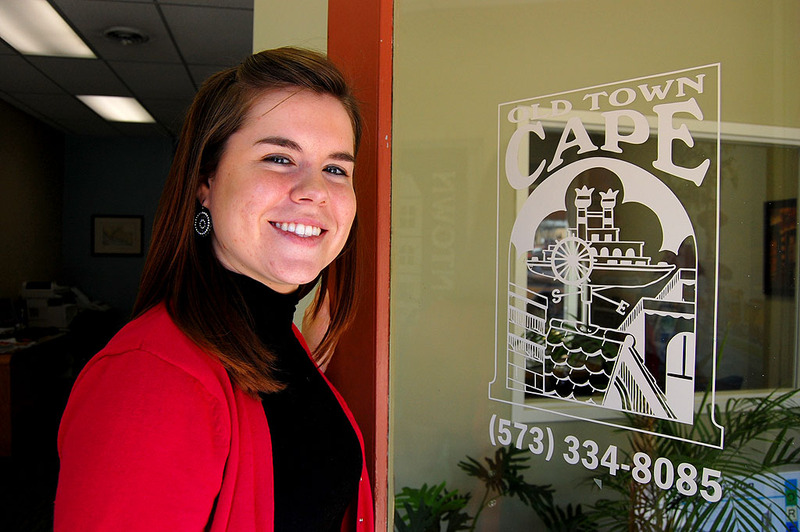 Dr. John Crow’s oldest is a doctor and his youngest in a dentist, practicing in Cape. Boh graduated from Cape Central as did his third son. Actually I think it was Crowe, now Crow.